Are you ready to begin your career as a licensed CPA, but aren’t quite sure what you’ll need to do to make it happen? Here are the steps you’ll have to take before you’re able to get your certified public accounting licensure in Indiana. Indiana requires CPA candidates to obtain their credit requirements in one of two ways. For the second option, credits obtained in a two year programs, online courses, and correspondence courses are acceptable as long as they come from an accredited college or university. After you’ve completed your education requirements, the next steps will depend on each candidate’s individual situation. Download an exam application or register online on the CPA Examination Services (CPAES) website. All correspondence, including applications and supplemental documents, should be sent to: CPA Examination Services, Indiana Coordinator, P.O. Box 198469, Nashville, TN 37219-8469. Wait to receive your Notice to Schedule to arrive. Once you have that, you may schedule your exam date. Be sure to arrive at your exam location at the scheduled time, prepared and punctual. You can expect to receive your scores within a few weeks of testing. Multiple types of valid experience may be combined for a total of 24 months, with the exception of clerical positions held in an accounting or financial office. Any part-time employment must be converted into full-time hours for the sake of accurately calculating experience. Your supervising CPA must complete the Verification of Experience form, which must be notarized and submitted to the Board. Give your manager a stamped envelope addressed to: Indiana Board of Accountancy, Professional Licensing Agency, 402 West Washington Street, Room W072, Indianapolis, IN 46204. 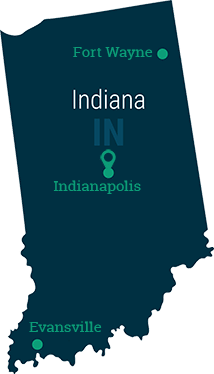 Once you’ve completed the education, examination, and experience pieces of the process, you can go ahead and apply for your Indiana CPA license. Fill out parts I and II of the Indiana State Accountancy Application after confirming that your transcript and employment verification have been submitted. Send your application, supplemental documents, and application fees to: Indiana Board of Accountancy, Professional Licensing Agency, 402 West Washington Street, Room W072, Indianapolis, IN 46204. With evolving regulations and practices, it’s vital for CPAs to keep their knowledge up to date with continued professional education (CPE). You’ll need to complete the following to remain eligible for license renewal. You can accumulate CPE hours by holding discussions or lectures, self-study (with verification of completion), or attending graduate school courses. It may be worthwhile to consider joining the Indiana CPA Society. You’ll stay in the loop when new rules and regulations hit the accounting and finance industries, and do plenty of networking along the way.